Chief Constable Nick Gargan has demonstrated Avon and Somerset’s support of the learning disability community by helping to launch the 2013 Special Olympics GB National Games in Bath. In attendance at Wednesday's ceremony with PCC Sue Mountstevens, he joined tennis player Thomas Mellor in lighting the Olympic cauldron, as well as meeting many of the games’ 1,700 athletes. 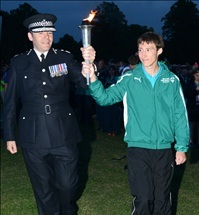 Sue Mountstevens said: "I had a truly wonderful evening at the Special Olympics opening ceremony. It was a real privilege to have been invited, let alone assist in lighting the cauldron. "The atmosphere was electric, with hundreds of athletes enjoying themselves with their friends and families. There was a real sense of pride throughout Bath as everyone came together to make it such a fantastic event." The Games, which began yesterday [28 Aug], will continue at locations around the force area until Saturday.